Rapid Overhead Deployment Trailer Demo - Sauber Mfg. Co.
Members of DTE Energy recently visited Chicago to do some hands-on operation and enjoy a demonstration of the new (Model 1572) Rapid Overhead Deployment Trailer. Hosted by ComEd and joined by Sauber, the utility had a chance to query Milan Krpan, who has directed the coordination and audit of field trials over the past 8 months. 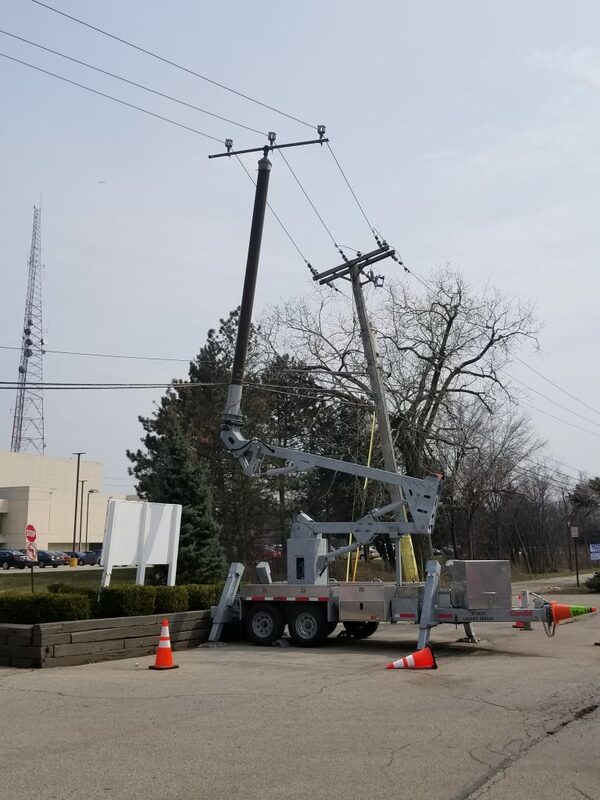 Additional units are currently in production and are slated for deployment to areas that ComEd estimates will have a significant CAIDI reduction by decreasing the time it takes to restore all customers impacted by broken pole outages. Initial conservative estimates with these trailers used on 25% of the broken pole outages show a system wide CAIDI reduction of 0.25 minutes. There are also labor savings associated with avoiding calling out crews after hours or disrupting planned work, as this solution allows permanent pole repairs to be finished on the next regularly scheduled shift. The primary benefit is faster customer restoration and the corresponding improvements to customer satisfaction scores.